Stand with your side to a chest-high cable pulley. Grasp the stirrup (handle) with the hand nearest the pulley, pull the stirrup to your chest, and place your free hand over the hand holding the stirrup. Stand with your knees slightly bent and your feet flat on the floor. 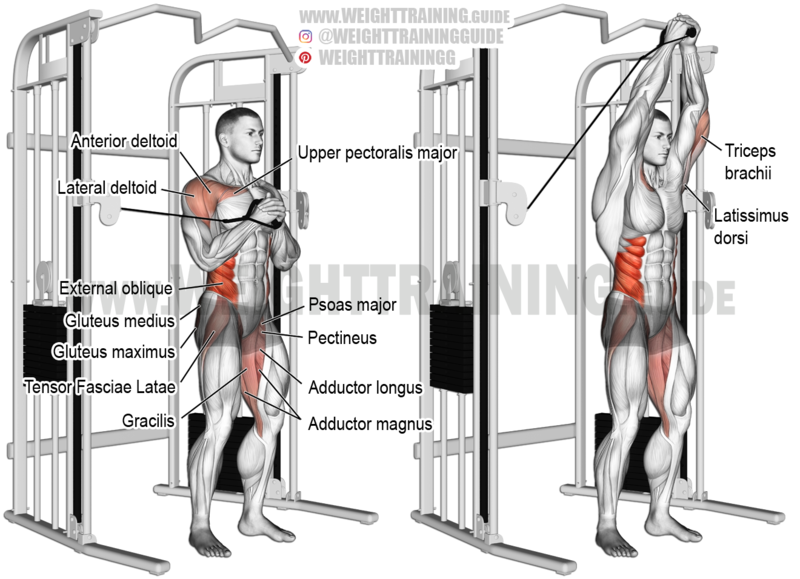 At this point, you should be resisting the weight of the plate stack, which should be forcing your body to rotate. Extend your hands upward, over your head, until your elbows are locked. Hold for a count of five without allowing your body to tilt. Bring your hands back down to your chest. Repeat the exercise on your opposite side. The cable vertical Pallof press is a brilliant functional exercise for strengthening your core’s ability to resist lateral flexion forces. Use it to develop a stronger and more stable core. The muscles are exercised isometrically, not dynamically. See also the cable horizontal Pallof press. This is a decent demonstration of the vertical Pallof press using a band instead of a cable. This is why this site stands out for me. Beneficial exercises and good advice. Thanks again, from Texas. I’m definitely delighted I found this site!